A survey is a measurement of a tract of land and its boundaries and contents. Situations in which a survey is advisable include when land is bought, sold, cleared or divided; when planning construction projects or subdivisions; when harvesting timber; or when building a fence. A survey is often required by lenders and is necessary to obtain title insurance or flood insurance. Participants in real estate transactions, and their sales agents, brokers, and attorneys, should be familiar with the types of surveys available. 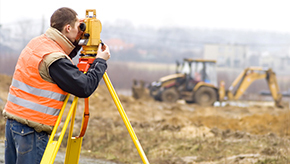 Land surveyors are licensed by the Texas Board of Professional Land Surveying. 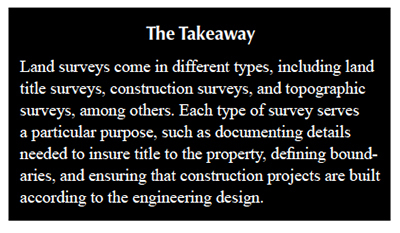 The types of surveys available are set forth in the Manual of Practice for Land Surveying in Texas, published by the Texas Society of Professional Surveyors. The professional services of a Registered Professional Land Surveyor are divided into categories, each of which is defined in the manual and has specific requirements. Categories are further divided into four "conditions," determined by the location of the site to be surveyed (urban business district, urban, suburban, and rural). This is the survey real estate professionals will encounter most often. Whenever a transaction requires a title policy, such as when property is purchased or refinanced, this survey is required. A Land Title Survey is a comprehensive investigation and evaluation of factors affecting boundary locations, ownership lines, rights of way, and easements within or immediately surrounding a property. The distinguishing characteristic of a Category 1A survey is that it provides what the title company needs to insure the title. It includes greater detail than a standard survey. It shows recorded easements, as well as any evidence indicating the possibility of prescription or limitation rights, and visible improvements. if required, a written report of the surveyor's findings and determinations. Sometimes this will include opinions, particularly if the surveyor finds conflicting evidence. While the survey must be accurate and complete for the purposes of title insurance, in practice, the degree of detail will depend a lot on the nature of the transaction. The sale of a residence will likely require substantially less detail than a large commercial transaction. Because survey matters are standard exceptions in a title policy, buyers want the most accurate survey possible to protect themselves from unpleasant and costly surprises. A surveyor is impartial and simply records what is found in the records and on the ground. The survey should be reviewed by an attorney. This is a traditional boundary survey. While similar to a Land Title Survey, it is not for title-insuring purposes. It locates the boundaries and determines the area, and it may include rights of way and easements within or surrounding the parcel. However, it normally does not locate improvements, rights of way, or easements within the surveyed site unless requested by the client, or in cases in which the surveyor in his professional judgment observes something that might indicate an encumbrance. Like a Land Title Survey, the surveyor sets monuments for all corners, points of curves, or references to property lines; provides a signed, sealed, and dated written description and a signed, sealed, dated, and certified map or plat clearly depicting the survey as made on the ground; and, as required, a written report of the surveyor's findings and determinations. references to monuments and specific locations for use in planning construction. A Locative Survey is often called a layout or stake-out survey or a site plan, and is usually done as a preliminary step in a construction project. It establishes the location and position of various structures in relation to the boundaries of the site. The surveyor may install reference stakes, markers (or monuments), construction baselines, and benchmarks. The surveyor also prepares a plan or drawing showing the perimeter of the property and the location of the stakes or monuments and data sufficient to identify them. The survey also includes a signed, sealed, and dated written description. 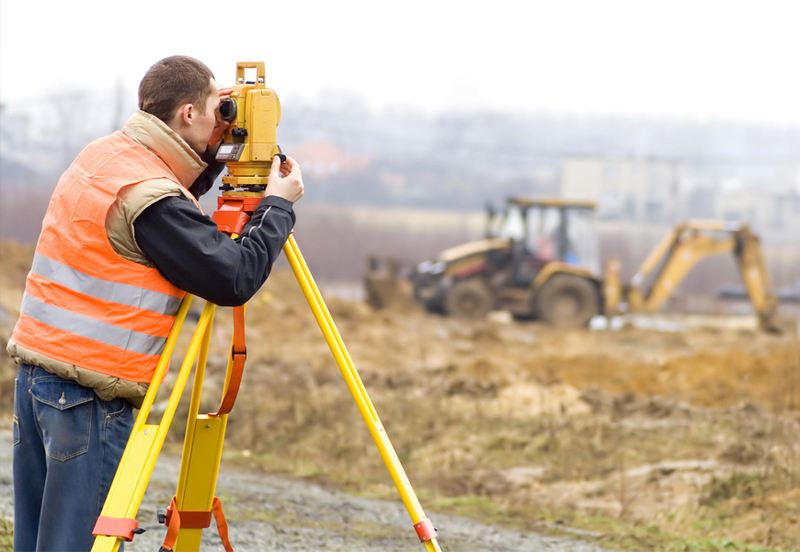 A Locative Survey is similar to a Construction Survey and may become part of a Construction Survey. However, it only involves locating the proposed structures. It does not necessarily include continuous or periodic observation of the site as construction progresses. Category 4 was once for mortgage loan inspections but has been reclassified as Category 1B. For continuity, the remaining categories retained their original numbers. A Construction Survey usually follows or includes a Locative Survey. It is performed before, during, and/or at the end of a construction project. The surveyor makes measurements while construction is in progress to control elevation, horizontal position, dimensions and configuration, and, following construction, to obtain essential dimensions for computing construction pay quantities and establishing "as built" conditions. In other words, the surveyor makes sure the building is built according to the engineering design. A Construction Survey might include a "slab survey" after pouring the slab but prior to framing, to make sure it's in the right place, as well as an "as built" survey after construction is complete. locative descriptions of the control points. A Horizontal Control Survey is used as a framework to which other surveys are referenced and adjusted and, therefore, must be extremely accurate. It ties a particular location to the National Geodetic Survey and the Texas Plane Coordinate System, which are consistent coordinate systems used to establish latitude and longitude. These surveys establish a network of points on the ground sufficiently accurate to provide control for any surveying project. They are needed for accurate mapping and charting projects and in construction of underground utilities, power lines, highways, bridges, tunnels, and dams, and are particularly adaptable to property and subdivision surveys. By statute (Natural Resources Code, Ch. 21, Subchapter D), state plane coordinates may be referenced in deed descriptions. Vertical Control Surveys also are tied into the National Geodetic Survey and used as benchmarks for other surveys. They must be very accurate. They determine elevation relative to sea level and are used for surveys of tidal boundaries, locative and construction surveys, route surveys, topographic surveys, investigative surveys, and making measurements from photographs. Investigative Surveys are used when it's necessary to determine the location of certain features or improvements, and their locations relative to each other, to determine the effects of an actual, impending, or planned occurrence. Examples include investigation of serious accidents for litigation purposes, mitigating natural disasters, determining whether a structure or other object is an encroachment on a property, and measuring ground subsidence or erosion. A Geographic Information System (GIS) Land Information System (LIS) for surveying is the creation of maps and databases representing boundaries, manmade objects, natural features, or topography. The maps and databases are used as elements of GIS/LIS mapping applications. Surveys are a key part of any real estate transaction. Knowing the different types of surveys and the purpose each serves is valuable knowledge for real estate professionals. E. V. "Rusty" Adams III (rusty@brazoslawyers.com) is an attorney with the Peterson Law Group in Bryan-College Station.